The Monday print column lukewarmly defended the Twins decision to move Miguel Sano to the outfield. Sano's work with guest instructor Torii Hunter on the nuances of outfield play has attracted the attention of the beat writers in Fort Myers, for obvious reasons. And one universal theme in the accounts: Patience. Sano is going to make mistakes out there. The people who decided to put him there know that, and they are going to accept that -- so long as he's working on the nuances. How bad does Sano have to be to convince the Twins it's a mistake to put him in the outfield? I believe the Twins will simply reject the premise that it was a mistake. Maybe they'd get there in 2017, or 2018. But not this year. He going to get a very long rope out there. I doubt the Twins would decide to move him again this year no matter how poorly he plays. Too many other roster decisions were made with his outfield shift in mind. They'll live with whatever blunders he makes and work to improve his outfielding skills. The only way they'll declare it a failure is if the running in the outfield results in leg injuries. This photo reminds me of a story the advisor of my high school paper told us in driving home the need for us to supply detailed photo assignments. According to him ... the sports staff at an unnamed paper was given to giving vague assignments. One day, the photographer, having been given an assignment that said simply: "football photo," appeared right at deadline and handed the sports editor a beautifully focused and well-lit photo of a football. The photo assignments got more attention after that ran as lead art. And more than 40 years later, I have that story stuck still in my head. Neal Cotts, who finished 2015 in the Twins bullpen, signed a minor league deal Friday with Houston. I'm told #MNTwins never made an offer to proven LH reliever Neal Cotts, who signed w/#Astros today. I'm fine with that, of course; I've said here repeatedly I'd rather the Twins give a serious opportunity to a prospect than recycle a veteran. Today marks the first day of full-squad workouts in Twins camp. Kennys Vargas was one of the last arrivals to camp and is said to be 14 pounds lighter this spring. Dexter Fowler turned down the Cubs qualifying offer (one year, $15.8 million). The big multiyer deals he apparently anticipated didn't roll in, and he wound up re-upping with the Cubs for one year, $13 million. Fowler complains about the system. He doesn't, apparently, recognize that the market for a 30-year-old center fielder with a slightly above average bat and a history built in hitters parts ought to be limited. I don't spend much of my sympathy on marginal QO types who turn the offer down and struggle to find a job. Fowler and/or his agent misread the market. That's on them. I'm pretty sure Frank Robinson and George Brett won't approve, but baseball finally acted to protect pivot men from baserunners. All it took was a broken leg on national TV. Chase Utley's playoff game-deciding cheap shot was the catalyst for Rule 6.01(j). The rule is pretty simple: A baserunner breaking up the double play has to slide, he has to touch the base, and he has to make an effort to stay on the base. He also can't swerve out of his pathway. The thing is, 6.01(j) is only there because the umpires long ago decided to abdicate their responsibility. Rule 6.05(m) should have sufficed, but umpires never make that call. Perhaps taking the play out of the "umpire's judgment" will work. This is good change. Less good: replay is being expanded to include the "neighborhood play," which it didn't cover last year on the basis that it would force pivot men to hang around the base longer and lead to more second base collisions. I suppose the rule-makers figure adding 6.01(j) will take care of that. What we're going to get is a repeat of what has happened with slides: Plays that were never questioned before replay will be now, with frame-by-frame review of whether the fielder's foot was in contact with the base while he handled the ball. Joe Posnanski was probably right last year when he said replay should be only at full speed. If the call isn't clearly wrong at full speed, let it stand. The Twins haven't decided who will get the ball opening day. Both Paul Molitor and Terry Ryan have cast that decision as something of a competition among the starters. Opening Day starter is probably a distinction without true significance. The vagaries of schedules and injuries quickly scramble the matchups; the popular notion that Opening Day starters spend the season largely matched up against each other is nonsense. But tradition dictates that you throw your best pitcher on Opening Day, and if the role matters to the player(s), it matters. In my view, there are six leading candidates for the starting rotation, with the other candidates coming into play only if there are multiple injuries or other factors. The six, alphabetically: Tyler Duffey, Kyle Gibson, Phil Hughes, Tommy Milone, Ricky Nolasco and Ervin Santana. Gibson: Led the 2015 starters in innings and ERA. Boosted his strikeout rate last year, and some see a possible breakout season ahead for him. Hughes: 2015's opening day hurler, his 2014 is probably the single best season in the field. Said to have reported to camp in better condition than last year. Santana: The highest-paid pitcher in team history, he finished last season with seven quality starts during which time he put up a 1.62 ERA. OK, there's no Cy Young favorite in that bunch, but it's a better collection than, say, the year Scott Diamond entered camp as the presumptive Opening Day starter. My expectation right now is that Santana will be the choice, My preference, since I still harbor some resentment over Santana's PED suspension last year, would be Hughes. But, again, I don't think the choice carries as much significance as will the choice of who fills out the rotation, The Twins expect and need all three to make 30-plus starts. When they come is of lesser importance. Joe Mauer reported Tuesday to Fort Myers and and was predictably questioned by the assembled media about the Brian Murphy scoop on his blurred vision. We'll see. As I've said before, Mauer's at an age where decline should be expected. Parallels have been drawn to Justin Morneau, who won a batting title at his age 33 season after several years of dealing with post-concussion symptoms. But that's a rather meaningless comparison. Among many other factors, Mauer's not working with Coors Field as a home environment. Morneau, by the way, remains unsigned, and I've not seen his name connected to any team this winter. He was limited to just 49 games and less than 200 plate appearances last season for Colorado, and he turns 35 in May. He wants to play, but I suspect that he will wind up being one of the many players who don't get to choose when their careers are over. I thought the most intriguing piece of information out of the first day of workouts for Twins pitchers and catchers was this from Mike Berardino of the Pioneer Press: Relief prospect Nick Burdi is experimenting with a split-fingered fastball. This comes off in Berardino's piece as Burdi's brainstorm, not something that is being pushed on him by a pitching coach. No matter who it came from, I doubt it's a good idea. Burdi has a fastball that approaches 100 mph and a plus slider; I can name any number of relievers who have thrived with a fastball-slider arsenal that isn't nearly as impressive. Burdi's ascent through the farm system did hiccup last season; he opened in Double A, fared ill, was demoted to High A, got his command straightened out, and finished in Double A before allowing one run in the Arizona Fall League, His problem wasn't repertoire, it was location. Uncertain command of three pitches does not trump uncertain command of two. Another curious aspect of this: The Twins have for years been loathe to have pitchers use a splitter. I can only think of two such pitchers since the mid 90s, Carlos Silva and Mike Pelfrey last year, and they were both veterans on the last year of their contract who almost desperately needed some sort of reliable off-speed offering, Silva's case was particularly amusing; He reported to camp talking about his new split-fingered fastball, and by the end of the week the terminology had been changed to changeup. I imagine that somebody (then-pitching coach Rick Anderson?) told him: You can throw it, but I don't want these 20-year-olds thinking they can try it. The splitter didn't really work for either Silva or Pelfrey. Pelfrey used it for 14 percent of his pitches last year (according to Baseball Info Systems) and put up his usual mediocre numbers. Anyway: Neal Allen may be more open to the splitter than Anderson was, but there are reasons the pitch fell out of widespread use about 20 years ago -- elbow strain and command prominent among them. Burdi probably doesn't really need a changeup, and I rather expect that his experiment will be squashed. I posted the other day about Jorge Polanco's uncertain future with the Twins. Baseball America lists him as the 99th best prospect in the game. The precise ranking is basically immaterial, of course; the point is, he's a legitimate major league talent. But as the J.J. Cooper tweets I included with that post suggest, there are plenty of superior shortstop candidates in the minors today. BA's list contains four shortstops in the top nine: Corey Seager of the Dodgers (1), J.P. Crawford of the Phillies (6), Orlando Arcia of the Brewers (8) and Trea Turner of the Nationals (8), Nick Gordon, the Twins' first-round pick in 2014 who had a solid season in low A, is No. 53 on the BA list; I counted 13 shortstops ranked ahead of him. Between Gordon and Polanco, BA lists four more. And last year was noteworthy for the sheer bulk of superb rookie shortstops -- Carlos Correa, Francisco Lindor, Addison Russell. Xavier Bogaerts of the Red Sox is entering his fourth major league season and is all of 23. The point being, the game is awash today in young shortstops. Not all of them will stick at shortstop, of course; I don't really expect Polanco to either. But that's the pool of talent he's competing with to get a major league job, whether at short or second or even third base. And with that many competitors of similar age who can reasonably be regarded as superior or equal to him, his trade value may not be a high as we tend to believe. 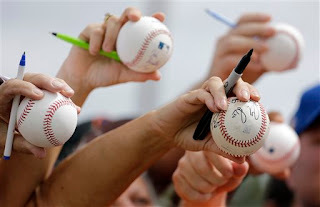 training facility to sign their baseballs. It's that time of year again, when baseball begins to bloom in Florida and Arizona. Good times. Tony Phillips, a multiposition player who played in more than 2,000 games over his 18-year career and had only one season as a true regular at one spot, died this week. He was 56, which means he was younger than me, which probably should bother me more than it does but apparently bothers me enough to drag it into this first paragraph and leave it in. Anyway: Phillips emphatically fit my definition of a "superutility" player, which is tighter than the definition that the Twins beat writers appear to employ. They use the term for somebody who plays outfield and infield; I reserve it for players who not only play in both infield and outfield, but who hits well enough to be a lineup fixture while fielding well enough to play at least one up-the-middle spot at least part time but not so well so to be a full-timer there. That's Ben Zobrist in today's game. That's Cesar Tovar for the Twins in the late 60s (in 1970 he became the full-time centerfielder.) And that was, emphatically, Phillips in the 1990s, after he left the Athletics. It could have been Michael Cuddyer with the Twins in the previous decade, but Ron Gardenhire clearly didn't trust him enough as a second baseman to give me more than token time there, Right field, yes; first base, yes; second base or center field, only in an emergency. That's not a superutility guy, in my view. The Google search I employed this morning on Phillips's death to check exactly when he died (Feb. 17, although the news didn't break until Friday) led off with two -- New York Times and ESPN -- that emphasized the he made the play that ended the 1989 "earthquake" World Series, which is a nice bit of trivia but isn't really what makes Tony Phillips,baseball player, memorable. It was the versatility and the mid-career sea-change as a hitter. With Oakland, where he spent the first eight years of his career, he was a league-average hitter. With Detroit, he started drawing 100 walks a year, and that made him one of the best leadoff men around, even if Sparky Anderson seldom played him at the same position two days in a row. We're going to see chatter about Danny Santana as a superutility candidate this spring. He's out of options, he's spent most of his major league time at center and short, he spent much of the winter ball season as second base in the Dominican. But in my mind, he's not a superutility guy if he's not getting 500 or more at-bats while shifting all over the diamond. The players who can do that are rare indeed. Nick Punto made it official Thursday: He're retired. It was a nice career. He squeezed 14 big league seasons out of his ability. His lack of power made him consistently a below-league average hitter, and his fielding chops kept him on rosters and in lineups. It was an odd thing: Every time the Twins went into a season planning on Punto holding a specific infield slot, that plan turned sour. When they turned to him in midseason to fill a slot after somebody else failed, he thrived. 2006, when he took over third base after Tony Batista flopped. 2008, when he took over shortstop from Adam Everett. 2009, when he supplanted Alexi Casilla at second base and put up a .406 on-base percentage in September. Punto was a better Plan B than a Plan A.
I commented the other day about Brian Duensing's inability to find a team. On Thursday the Kansas City Royals announced that they had signed him to a minor league contract. The defending World Series champs have, as we all know, a pretty deep bullpen of power arms. But those power arms are right-handed. Duensing has a decent chance to land a roster spot there. And if he does, he'll be mates again with his fellow Nebraska alum and pal Alex Gordon. Duensing doubtless was holding out for a major-league roster spot. He didn't get it. But he landed, in short, in as good a spot as he could have asked for this close to training camp. Working on position rankings reminds me how thin the minors is at 3B right now. It's nearly barren. Also amazes me how deep the SS position is. Yes, a lot of 'em will move, but I'd take the 60th best SS in MILB over the 20th best 3B. Which seems relevant when considering Jorge Polanco, rated by BA as the Twins' No. 6 prospect. Polanco has played primarily shortstop the past two years, but the general consensus is that his arm is a bit weak for the position. Second base is his best spot, but the Twins gave Brian Dozier a multi-year deal, so that spot is blocked. Polanco's bat is major-league ready, but there's no place to put him. He has one option left, and unless somebody gets hurt in camp he's destined for Rochester, presumably to again do battle with a position for which he's an ill fit. Third base might be an option, but if arm strength is an issue at short, it's an issue at third. (Dozier, it should be remembered, is a second baseman today because he doesn't have a true shortstop's arm either.) And Trevor Plouffe doesn't become a free agent for two years, so opening third for Polanco would require a trade, and there's no reason to believe the Twins are interested in dealing Plouffe. But somebody's going to get traded someday. Polanco is too talented a prospect to languish indefinitely in the minors, and even if he's blocked for 2016, something will have to happen for 2017. Hu did not make the Twins Top 30 (or 31) list last winter. He's No. 16 on the Rays list in this year's Handbook. Baseball America grades him as a "50 High" -- the 50 is on the scouting scale of 20 to 80, and the "high" refers to his risk. (No pitcher in A ball is going to have a risk rating lower than "high.") 50 High is the same grade BA gives Twins pitching prospects Kohl Stewart, Steven Gonsalves and Nick Burdi, who rate as the Twins No, 8, 9 and 10 prospects. The grade suggests that Hu, had the Twins retained him, would rank somewhere between No. 8 and No. 16 in the Twins system. Nos. 14 and 15, Taylor Rogers and J.T. Chargois, are graded as "45 Medium," meaning that their ceilings are a bit lower but they are more advanced, but it's still an equivalent grade; No. 16, Adam Brett Walker, is a 45 High, and Hu would clearly go above him. My subjective guess is that Hu would have been put lower in the Twins group -- somewhere with Rogers and Chargois rather than with Stewart and Gonsalves. The Rays have a good and deep farm system; prospects with an equivalent grade to Hu can be found as low as No. 22 in the Tampa Bay list. I liked Hu when I saw him make his Cedar Rapids debut in 2014. While trading him for Jepsen was a certainly the right move given the Twins situation last July and remains a defensible move, there's a decent chance the Twins will someday wish they'd given up somebody else in that deal. The Twins didn't do as aggressive a bullpen overhaul this winter as I might have preferred, but they did cut ties with a pair of veteran relievers who combined for 123 appearances last season in Blaine Boyer and Brian Duensing. Boyer wound up signing a minor league deal with the Milwaukee Brewers, this after putting up a 2.49 ERA for the Twins. Duensing hasn't even gotten a minor league deal anywhere, and camps are about to open. Duensing, about to turn 33, is left-handed and breathing, so if the cliche were true, somebody would have signed him by now. He's not the only veteran lefty looking for a job -- Neal Cotts, his colleague in the Minnesota bullpen late last season, is also jobless, as are some others -- but Duensing is of particular interest to me because he has been a fixture on the Twins roster for seven seasons. Why so little interest in Duensing? Perhaps because his strikeout rate has been in steady decline. In 2013 -- his first season as a full-time reliever -- he struck out 8.3 men per nine innings. In 2014, his K rate was down to 5.5; last season, a paltry 4.4. For that matter, Boyer's strikeout rate was just 4.6. Eleven pitchers relieved in more than 20 games for the Twins last year. Nine of them are back (one, Aaron Thompson, on a minor league contract). The two who are gone are the two with the lowest strikeout rates. I doubt that's a coincidence. Baseball America rated him the Twins No. 4 prospect heading into spring training 2014 and again last year. This time, he's No. 8, and BA left him out of its Top 100 list, which was released Friday night (he was No. 52 in 2015). It's not difficult to see the reason for this fade in status in his stats. Last year, in High A ball (Fort Myers of the Florida State League) Stewart saw his walk rate rise to 3.1 per nine inning and his strikeout rate decline to 4.9 per nine innings. These are not good numbers. That's scouting the stat line. Stewart's stuff is better than his results so far. Indeed, there are some positives in his numbers, particularly the two home runs allowed all season. True, the FSL is known to suppress power numbers, and the Fort Myers park is particularly difficult for long balls, but two taters in 128 innings ain't bad at all, and he allowed just two homers in 2014 as well. Stewart still has a four-seamer in the upper 90s, still gets a lot of grounders with his hard two-seamer, still has a curve and slider that Mike Berardino's Handbook write-up describes as "reliable weapons." So far he looks like a reincarnation of Nick Blackburn, and that certainly wasn't the hope or expectation when they drafted him so prominently. Stewart should open 2016 atop the rotation at Double-A Chattanooga, The hope is that he'll start to miss more bats as he learns more about pitch sequencing, but he profiles as a mid-rotation starter at best. A mid-rotation starter is not to be sneered at, but he wasn't drafted with that as the goal. Imagine hanging around a guy who talked like that all season. So ... what to make of Joe Mauer's public admission to the Pioneer Press' Brian Murphy that symptoms from his 2013 continued to plague him even last season? First, we need to understand exactly what Mauer said and what he didn't. If you haven't read Murphy's story, do so. The link's above. The aggregation sites (and this very post) distill and, even without intending to, distort the story ever so slightly. Go to the original source; if nothing else, Murphy deserves the clicks. The blurred vision is described as occasional and was, Mauer believes, triggered by bright light. (He will try playing with sunglasses during spring training next month; that obvious change in his routine is probably what prompted this revelation.) And he implies that he didn't let team management know of the vision problems. For what it's worth, Mauer's slash stats in the daytime last season were markedly lower than his numbers in night games. But even his nighttime numbers weren't up to his career standards. His strikeout rate was also markedly higher in day games. (Data from Baseball Reference.) Checking 2013's splits -- that being his last season behind the dish, a season that ended with his concussion and that saw him post his third-best OPS+ -- he hit better in day games than at night, but so slightly that it may well be just statistical noise. Was Mauer hurting the team by playing? My answer is no. He wasn't Joe Mauer, chronic batting title contender, but he still had the best on-base percentage on the roster other than Miguel Sano, who was only there for half the season. He was roughly a league-average hitter last year; that is also true of Brian Dozier and Trevor Plouffe. Should Paul Molitor, Tom Brunansky and the rest of the brain trust have known? The culture of athletics, especially at this rarefied level, is: Play through it. Mauer's taken a great deal of public criticism (even if he never acknowledges it) as a brittle "China doll," and that may have led him to hide his recurring symptoms. It seems inevitable that the manager, coaches and front office could tell that it wasn't the same Mauer as before the 2013 concussion, but that there were specific concussion symptoms recurring, that might not have been obvious even to people close to him. Is it going to get better? Mauer sounds optimistic. He says he hasn't had any symptoms recur during his workouts the last three months, and that that hasn't been the case for a couple of years. But without digging through the archives, I think he's said the same thing the last couple of spring trainings. Here's the deal: Mauer turns 33 in April. He spent a decade behind the plate. Even if his brain is fully healed from the 2013 trauma, age and other physical decline takes their toll. It is simply unrealistic to expect him to return to hitting .330 as he did in his mid-20s. I'd love to see Mauer rebound to that level, but I don't expect it. I have more hope now than I did before reading Murphy's piece that he will have a better year in 2016 than in 2015. But it's clear from my social media feeds that Law continues to be concerned that Jose Berrios' relatively short stature (he's listed at six feet) and lack of "plane" on his fastball will make him home-run prone in the majors. Berrios yielded 12 homers last year across two levels in 167 innings, which isn't a horrid rate but is twice as many as he's given up in any previous season. BA -- meaning Mike Berardino of the Pioneer Press -- lists Berrios as the Twins No. 2 prospect this spring, behind only Byron Buxton. He is, by all accounts, a better pitcher than the one I watched work one game in Cedar Rapids in 2013 He has mastered his changeup and sharpened his curveball. His walk rate has declined from 3.5 per nine innings with CR in 2013 to 2.1 in Double A-Triple A combined last season. Really, Berrios has nothing more to prove in the minors, and had the Twins not stacked the major league roster with the guaranteed contracts of multiple veteran mid-rotation starters, he'd be set for the opportunity to test his stuff against major league hitters this April. As matters stand, he's going to have to wait for that opportunity. Of the 31 Twins prospects ranked by Baseball America, five are shortstops: Nick Gordon (4), Jorge Polanco (6), Wander Javier (11), Engelb Vielma (18) and Jermaine Palacios (19). That sounds like a lot, but it really isn't. It's not that unusual for teams to have a lot of shortstops on such lists, because most amateur position players who get pro contracts were shortstops in amateur ball. 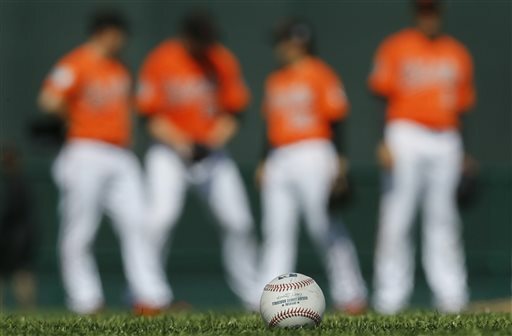 A player with the physical gifts to someday play major league baseball is probably the best athlete on his high school or college team, so they play short. A lot of them get sorted out to other positions early, of course, but the best talents open at shortstop and play their way off the position. This list of five is quite heavy with players at the low levels of the system. Javier, who was signed out of the Dominican last summer as a 16-year-old (breaking Miguel Sano's record for the biggest bonus the Twins have given a Dominican) hasn't played an inning yet. Presumably he'll start in the Dominican Summer League this year; if he dominates there, he might emigrate to the complex team in the Gulf Coast League. We are years from Javier making an sort of impact. Palacios started 2015 at the GCL and moved up to Elizabethton in the Appy League. He hit well, but that doesn't mean a whole lot, especially in E-Town. My guess is that if Palacios makes it to the majors, it will be at another position, but that's purely a guess. He's all of 19, so there's plenty of time. Gordon had a fine season at Cedar Rapids, and figures to open 2016 at Fort Myers in the Florida State League. That's still A ball, still a step south of the levels of the farm system from which a player might reasonably get the call to the majors. We're still a year or two (or more) from the 2014 first round pick challenging Eduardo Escobar for the big league job. ... the organization's best defensive infielder ... Vielma has soft hands, smoth actions and outstanding footwork to go with a plus arm and jaw-dropping range. The question is: Can he hit? He's apparently a bit bigger than he was when I saw him sitting out with an injury in Cedar Rapids in 2014, and his numbers didn't take a noticeable hit when he moved from the hitter-friendly environment of CR to the pitcher-friendly FSL, and those are both encouraging facts. On the other hand, he doesn't have much strike-zone discipline. He'll go as far as his bat can take him. And that leaves Jorge Polanco, who is more likely a second baseman. I'm slightly surprised he's still in the organization; management seems committed to Brian Dozier at second base and Polanco is an ill fit at short. It's quite possible that he will be an in-season trade chip. This figures to be Polanco's final option year. His bat is as major-league ready as it will ever be. * Mike Berardino of the Pioneer Press had this interesting (to me, at least) off-the-field item about Twins relief pitcher Casey Fien's involvement in the creation and business of a polling app called QVO. I know nothing about the app or the business beyond what's in the story, and that Carly Fiornia's campaign uses it doesn't appear to be much of an endorsement, but it seems fairly unique for a major leaguer to be so intimately involved in a high-tech endeavor. * Baseball America's college preview issue included this story on Kyle Funkhouser of Louisville and Kyle Cody of Kentucky, two high-round draft picks who spurned the pro offers and returned to college for their senior seasons. Cody, you may recall, was selected by the Twins with the No. 73 overall pick. It didn't help their draft at all that he didn't sign. * Jordan Schafer, the Twins opening day center fielder last year, will be in Dodgers camp this spring as a non-roster invitee. What's unusual is that he's apparently there as a combo pitcher-outfielder, with the emphasis on the pitching. There have been a few combo players in major league history, most recently Brooks Kieschnick, who spent two years with Brewers as a pitcher-outfielder. It's the kind of thing that's fun to think about -- two jobs with one roster spot! -- but really tough to pull off. Taylor Rogers is a 25-year-old left-handed pitcher who grew up in Colorado, pitched for the University of Kentucky and signed with the Twins as an 11th round draft pick in 2012, That figures to be a pretty significant draft for the Twins: Byron Buxton and Jose Berrios were the first two selections, and Tyler Duffey was their fifth-rounder, plus there are some other interesting arms still in the pipeline (J.T. Chargois, Mason Melotakis, Luke Bard). In that crowd, Rogers might have been something of an afterthought. Instead, he has moved steadily up the ladder. He spent 2015 in the Triple A rotation and racked up 174 innings; then he pitched in the Arizona Fall League for another 25. He was No. 15 on the BA Twins prospect list a year ago (one slot ahead of Duffey); he's No. 14 this year. He's been almost strictly a starter in his four seasons in the Twins chain -- 101 starts, eight relief appearances (including two stints in the AFL). But he's viewed more as a bullpen possibility for 2016, partly because of the bulk of starters ahead of him and partly because of his stuff and limitations. Rogers shows plus command and works at 90-93 mph with late movement on his fastball. His sluvry breaking ball, including a slower version at 76 mph, has helped him dominate lefties (.411 OPS). His changeup, however, still lacks the required separation, as shown by the .843 OPS and 41 extra-base hits he allowed to righties. He focused heavily on the changeup in Arizona, throwing as many as 15 per outing. There's a lot to like in that description and one obvious issue. I get the impression that the Twins are not that interested in carrying a true LOOGY (Left-handed One Out GuY); they want their lefty relievers to be able to deal with at least an occasional right-handed hitter. Theoretically, a pitcher lacking a straight change but with a quality breaking ball that he can change speeds on can thrive in the bullpen, but Rogers apparently needs something to combat righties with. Which. also theoretically, makes Neil Allen an ideal pitching coach pairing for him. Rogers will be in interesting pitcher to follow this spring. The annual Baseball America Prospect Handbook showed up in my mailbox this weekend, and I figure to wring a few posts out of it. Bryon Buxton (1); Jose Berrios (2); Max Kepler (3); Nick Gordon (4); Jorge Polanco (6); Kohl Stewart (8); Nick Burdi (10); Alex Meyer (12); Adam Brett Walker (17); Jake Reed (20); Randy Rosario (22); Yorman Landa (23); Felix Jorge (24); Ryan Eades (31). I've also watched Stephen Gonsalves (9) and Mason Melotakis (28) throw in spring training, and Engelb Velma (18) take infield instruction from Tom Kelly on a Fort Myers back field. Most of the rest have been in the very lowest levels of the system or, in one case, playing in Korea. Of the 31, 18 are pitchers; of the 18, six are left handed. Three of those southpaws -- Taylor Rogers (14), Rosario and Melotakis -- are on the 40-man roster and are at least theoretical candidates for the big league bullpen, although only Rogers has a realistic shot at coming north in April. Of the 13 position players, one (Stuart Turner, 16) is a catcher. Three are listed as first basemen, including Byung Ho Park (7); one as a third baseman; five as shortstops; and three as outfielders. That may look like an awkward distribution, but a lot of minor league shortstops wind up reaching the majors at a different position. See, for example, Trevor Plouffe and Brian Dozier. There's a scouting rule of thumb that says you don't sign an amateur second baseman; if a player has the talent to play second in the majors, he's almost certainly a shortstop in amateur ball. At least one of the five shortstops on the BA list, Polanco, will most likely be a second baseman where ever he gets to have his major league career. Today I offer the out-of-context fractured syntax and insight of Oscar Gamble, a 1970s platoon outfielder-designated hitter and possessor of one of the most glorious Afros ever seen on a major league field. "They don't believe it be like it is, but it do." Pat Reusse has a column today on Randy Rosario, left-handed prospect (and project) pitcher. I saw Rosario last August in Cedar Rapids and wrote this. Reusse quotes Rosario on his pitches: A high velocity but straight fastball and a wipeout slider. That matches what I saw in August. The Twins want to develop Rosario as a starter, and that's both sensible and understandable. There's more value in a starter than in a reliever, and even if he winds up in the bullpen, he'll get more innings, more chances to develop his pitches, as a starter. He hasn't pitched above the Midwest League yet. But ... we have an injury history, we have a (at this point) limited set of pitches, and we have an option clock that will start clicking this spring. My guess is that he's destined for the bullpen, and I really wouldn't be dismayed if it happens sooner rather than later. Here's an item that's been on my back burner quite a while: A detailed look by Baseball America's J.J. Cooper at why it is that Jeff Samardzija will likely get paid more over the course of his career as a middling starting pitcher than Calvin Johnson will as the best receiver in football. Cooper first posted a version of this about two months ago, when the rumors arose that Johnson would abandon his football career. It's an interesting comparison, since the two were collegiate stars in the same NFL draft (2007), and Johnson was viewed as a good outfield prospect as a high schooler. Samardzija chose baseball, Johnson football, and while Johnson has been paid more so far, Samardzija just signed a five-year deal for $90 million -- after leading the American League in runs and hits allowed. Meanwhile, Johnson reportedly has told the Detroit Lions he's had enough. Bennet Omalu spoke in SF tonight. He believes "if you play football at professional level there is a 90-100% chance you will suffer CTE." Omalu is a leading researcher on concussions; Will Smith plays him in the movie Concussion. No Twins fan of recent vintage can say concussions aren't an issue in baseball. The career arcs of Justin Morneau, Joe Mauer, Corey Koskie and even Denard Span testify to that reality. But baseball's CTE rate sure ain't 90 percent. Pitchers and catchers report to Fort Myers on Feb. 21. That's not that far away. Spring training can't come soon enough for this guy. The Twins announced Tuesday that they have signed Carlos Quentin to a minor league contract. Quentin at one point could hit -- he made two All-Star teams while playing for the White Sox, in 2008 and 2011 -- but he's been limited by knee injuries and officially retired last May. He's 32 now, hasn't played in the majors since 2014 and hasn't been anything approaching a regular since 2011. There's no serious investment in him, to be sure. Quentin's major league salary would be $750,000, which is sizable coin in my world but a pittance for somebody with nine years in the majors. But I really don't see the fit. The Twins signed a bunch of outfielders to minor league deals this offseason -- Joe Benson, Darrin Mastroianni, Ryan Sweeney -- and those three can all play center field. Even before the knee injuries eroded Quentin's career, he was never a good corner outfielder. I expect the Twins to open with a regular outfield of Eddie Rosario in left, Bryon Buxton in center and Miguel Sano in right. That trio would leave an opening for a fourth outfielder, but there's Danny Santana and Oswaldo Arcia on hand, and each is out of options. And there's Max Kepler rising from Double A, and there are the other three non-roster invitees. There's so little opportunity for Quentin with the Twins that one has to figure that there was literally nobody else willing to sign him. I seriously doubt that he can even make the Rochester roster. I was reluctant to buy into the notion last fall when the Twins first started talking about playing Miguel Sano in the outfield. But as the offseason progressed, it became increasingly obvious that they are serious about it. Sano said last weekend at Twins Fest that he's dropped five pounds. Since he reportedly weighed 268 at seasons' end, that would still leave him well over 260 pounds, and it's been a long time since someone that large played outfield regularly in the majors -- probably not since Frank Howard. Baseball Reference lists Hondo as 6-foot-7, 255 pounds, but at least one source says he reported to spring training in 1971 pushing 300 pounds. Howard had serious power and had a strong throwing arm when a young player but was always slow and a poor defensive player. I'm quite confident that Sano is a superior runner. The Twins are obviously counting on Sano's innate athleticism to make him an acceptable outfielder this spring. And it should be noted that if few outfielders are as large as Sano, even fewer third basemen are his size. Baseball players of Sano's bulk are rare, period, but when they do appear they are almost always first basemen or pitchers. Look at it this way: We are years away from the Twins having an opening at first base. There is legitimate concern that if Sano is limited to DHing that his weight will balloon even higher (he apparently gained weight last season after his hamstring injury limited his activity). I don't know that there's any more issue with Sano's size as a corner outfielder than there is as a third baseman. Meanwhile, the Yankees have an outfield prospect they're said to be quite high on, Aaron Judge, who is listed at 6-7, 275. That makes Sano look ... well, probably not small, but less startlingly huge than if he were standing next to me. Sano may be less of an outlier than we think. This made me suspect that there are some pizza places wherever it is that Graham calls home that are now on the verge of bankruptcy. Subsequent reports suggested that the process was a bit more complex than that, and that Graham lost even more than 30 pounds. Still, the bit about eating breakfast regularly ties into one aspect of the life of a pro baseball player that has to be difficult: the hours are so irregular. Most games are played at night, and half of them are on the road. Team frequently arrive in the next city in the wee hours; a player gets to the hotel at 4 a.m. and crashes. It's one thing for Graham, or any other pro athlete, to get himself into an ideal routine during the offseason. Sticking to that routine, especially in terms of sleep and diet, during the season is another matter altogether. Some well-paid stars have a personal nutritionist to help them maintain their regimen, but that's not really an option for, say, a prospect in a bus league. No matter how improved his physical condition, I doubt Graham will make the roster this spring. He stuck on the major league roster all season in 2015, but that was in large part because he was a Rule 5 guy. He doesn't have that lifeline in 2016. It's going to take a lot of somethings for Graham to come north this spring, I suspect -- not only Graham pitching well in camp, but injuries and or trades. He's one of multiple right-handed hard throwers who'll be in camp, and he's not at the top of the list.